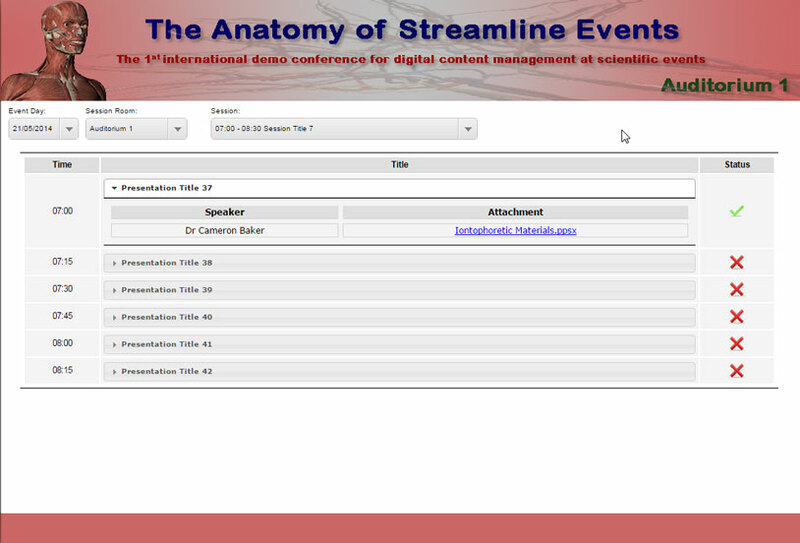 Provides seamless session management for conferences, seminars, workshops and other educational events. Enables organisers to distribute a vast amount of speaker presentations to simultaneous session rooms or wherever else they might be needed including translation booths, media centres. Through a pre-designed interface, distributed presentations are accessible via session room screens providing each presenter a timeslot in a specific date and time, providing a smooth transition from one presentation to another as well a peace of mind for presenters and organisers. It minimises administration work and onsite technical support. In-built reporting features allow event managers gain total control of session management including late submissions, delays, session room changes and as well cancellations. Integration with other SLE solutions incl. SLE Digital signage provides automated corresponding updates for session schedules. Centralised management allows organisers to collaborate with committees and other monitoring groups who involve session management irrespective of their locations. SLE Presentation Manager is cross device, enabling presenters maximized knowledge dissemination and thereby impact: Easy publishing of presentations to the web (Content repositories), mobile devices and digital hand-outs (CDs, USB flash drives etc.) enables delegates to access knowledge from any platform. All speaker content collected into one content library. Build session room menus with drag and drop functionality. Attach speaker content to conference schedule. User-friendly presentation display in session rooms for easy presentation management by AV-Crew or session chair. Presentation display for easy access to speaker content in session rooms.